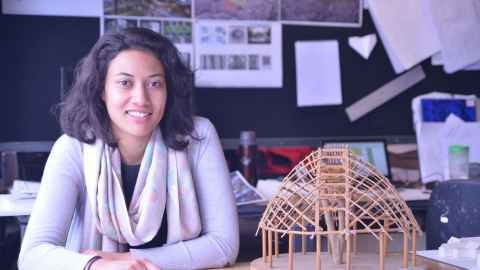 If you enjoy creative solutions and are committed to working hard, you should pursue architecture, says Master of Architecture (Professional) student Lusitania Vete. "I chose to do architecture as I enjoyed being creative and logical at the same time. It seemed like a natural choice for me. “In my first year I learned a lot more than I expected about design and the practicality of designing. It was much deeper thinking than I was used to. We work in open plan, collaborative studio environments which simulates how we will work as professionals. “I’ve also spent time in our wood and metal workshops. The technicians are really helpful; they are dedicated to health and safety and teaching you how to use all the tools and materials correctly to produce your work. “I've been on a study trip to Spain and Portugal, where we presented our work to one of the biggest offices in the world. That exposure to international architects, and getting their feedback, was invaluable. We are also given opportunities to interact with the local industry through the lecture series the School of Architecture and Planning host. “Architecture is about finding creative solutions to things. If you enjoy being creative and problem solving, and you're committed to working hard, I think you should definitely pursue architecture. I definitely want to become a practicing architect, however I’d also like to explore academia. My options are open, but I like the direction I’m heading in."